It’s always seems like when I get hooked on a new passion the universe seems to send me all sorts of information about that topic. Beginning in 2012 a bit of a Teddy Roosevelt obsession began for me when I finally got around to reading the final volume in Edmund Morris’ trilogy on the 26th President. Out of that grew a year fixation on the Spanish-American War and Philippine Occupation. Side note: Did you know we can thank the Phillipe Occupation for introducing the USA to waterboarding and mass circumcision of non-Jewish male babies? Yeah, me either! Coincidentally Seattle Asian Art Museum (which is situated in Seattle’s Volunteer Park, named for the volunteers who signed up for that “splendid little war”) hosted an excellent talk about the Philippines under the Spanish, then US. Next came the recent publication of Silencing Race: Disentangling Blackness, Colonialism, and National Identities in Puerto Rico by UW History professor Ileana M. Rodriguez-Silva. I can’t recommend this one enough. 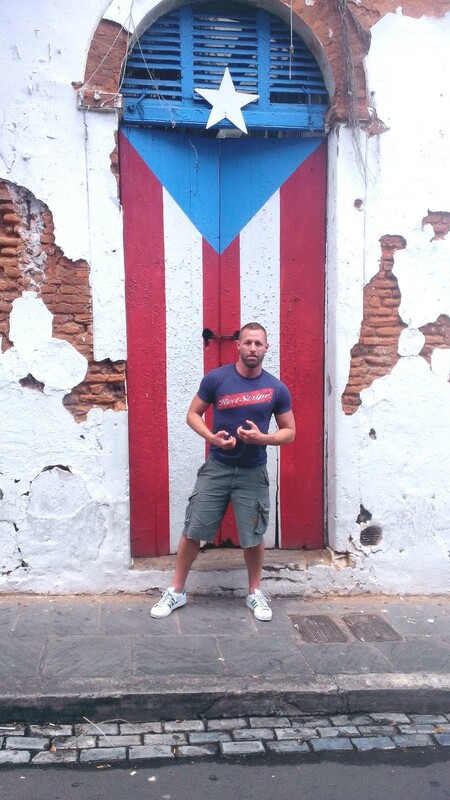 To cap off about a two-year phase, I figured it was high time for me to visit Puerto Rico. I’ll be leaving tomorrow for my first ever visit to the island! I found two really clever political cartoons that relate to my current obsession. Both use offensive imagery, but take opposite views on the same topic of newly found imperial possessions. 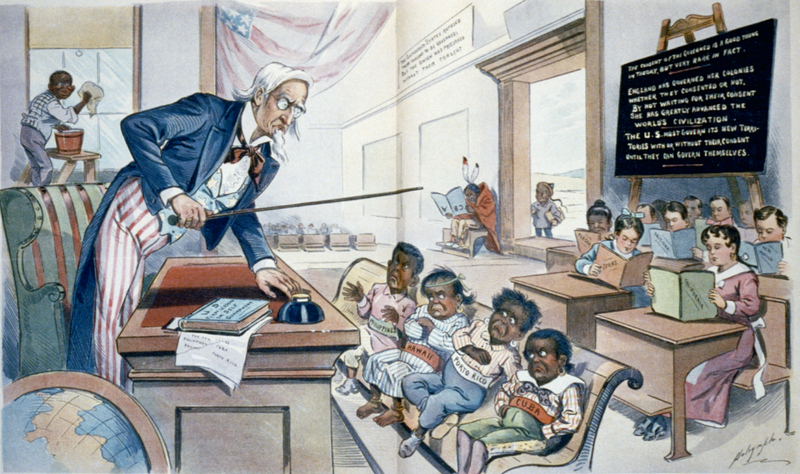 In this biting critique below Uncle Sam attempts to school his new, scared pupils acquired from Spain on democracy and self-determination (see the chalkboard). The Native American hunched in the Victorian version of a “time-out area” and the African-American child stuck washing the windows makes sly commentary on the USA’s hypocrisy of espousing self-determination. Many newspapers at the time harangued against the idea of the United States aping Europe who in the late 19th century was at its height of carving up Africa, the Middle East, and Asia into exploitive colonies. 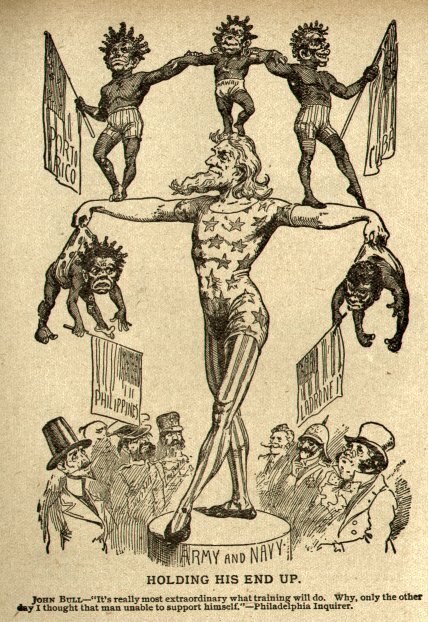 This 1899 political cartoon below takes the opposite view about the US and its new overseas possessions like Puerto Rico, the Philippines, and others (Ladrones refers to the Mariana Islands, also won from Spain in the war). Here Uncle Sam demonstrates that the USA has finally made it to the A-League of world powers! The audience of Germany, France, and other powers look on as Uncle Sam shows off his new talent of Imperial Rule. To the Americans’ credit there was an active, public debate about the ethics of colonial possessions (see above) not really seen in European nations where colonial possessions were mostly viewed as de rigueur. A decade or so later, in fact, the main reason many Danes publicly opposed selling the Danish West Indies (today the US Virgin Islands) to the United States wasn’t because of their profitability to Denmark but because of the feeling that to be respected as a “real power” colonies were essential. The snide caption “Why only the other day I thought the man unable to support himself!” is making note that a mere generation ago the US was torn apart in Civil War and threatening to splinter into pieces. Much was made in the press during the conflict with Spain about how sons of Union veterans and Confederate veterans were fighting shoulder-to-shoulder, united. This “splendid, little war” (Secretary of State John Hay coined that one) could serve as the final healing balm between North and South according to the pro-war newspapers. Wow, how interesting! Thanks for sharing these tidbits of history with us.